When it comes to small businesses in the Cayman Islands, few are as streamlined and effective as Simply Weddings, where couples can exchange nuptials in a customized fashion without overspending. The company’s founder, former Cayman Islands chief education officer Joy Basdeo, said though she created the business with cruise passengers in mind, Simply Weddings also caters to residents and stay-over visitors. There are several reasons the business is a success. Among them: the attention to detail and personalized service customers receive from Joy and her team. That has helped the business handle 106 weddings - and counting -- in the first six months of this year. Joy Basdeo performed the marriage rites for Josephine Kull and William Swenson at Smith Cove recently. Their trip was planned in a whirlwind when a rare opportunity came up to get away for a week, just the two of them. And, they thought: Why not do it now? Get married, that is. So Josephine Kull and William Swenson got on a plane in New Jersey and landed in sunny Cayman and did just that. Local residents may be surprised to learn that destination weddings are quite a big business here. As of 8 July, 346 visitors had been married in the Cayman Islands in 2010 alone. That’s actually a bit off the usual number, as the Island registers about 1,000 destination weddings per year. 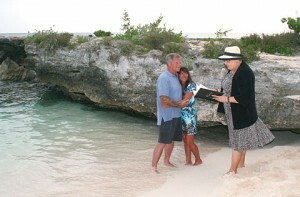 An American woman's dream of getting married in Cayman comes true. Jessica Guffey has always longed for a beach wedding in the ancestral home her great-great grandfather- Custos Edmund Parsons. 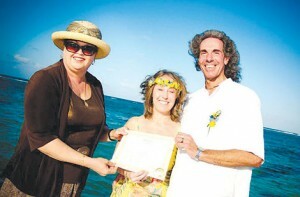 She finally had her special day last week as she renewed her vows on seven mile beach. News 27's photo journalist Leighton Pitterson captures the special moment. (Copyright 2010 CITN. All Rights Reserved). It’s the ultimate dream of many - getting married on a paradise island in the Caribbean. Destination weddings, as they are known, are increasingly popular with the bride and groom flying out parties of close friends and family to not just share in the happy day but also enjoy a once-in-a-lifetime holiday. And whilst the economic downturn has hit harder elsewhere, the sector has remained relatively robust. The wedding season in Cayman runs during high season, roughly between January and June. Rebecca Bateman-Green, head planner with Parfait Weddings and Events, noted that the season has been pretty good in 2012. “As usual, there are many large destination and local weddings around the months of March and April. In addition to these there has been a large volume of smaller wedding groups, including cruise ship passengers only in port for the day. Weddings for our company this season are up almost 25 per cent compared to last year,” she noted.